Hi everyone! It's been a bit. Working 2 jobs really knocked me back but now only 1 job and getting more time now. When 8th ed ended and age started, my night goblins got put away, I really didn't like the rules for them. With 2nd ed age and the new gloomspite, I've dusted them off. I'm getting everything set up to paint. 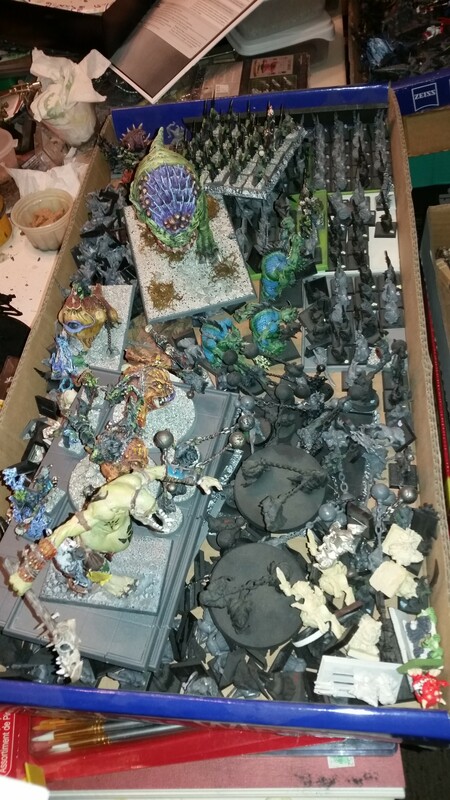 Unfortunately a bunch of my other projects will take a back seat to Skarsnik's band o misfits. Until next time, keep hobbying. Glorious Goblin army there, Dread, that's a lot of gobbos! 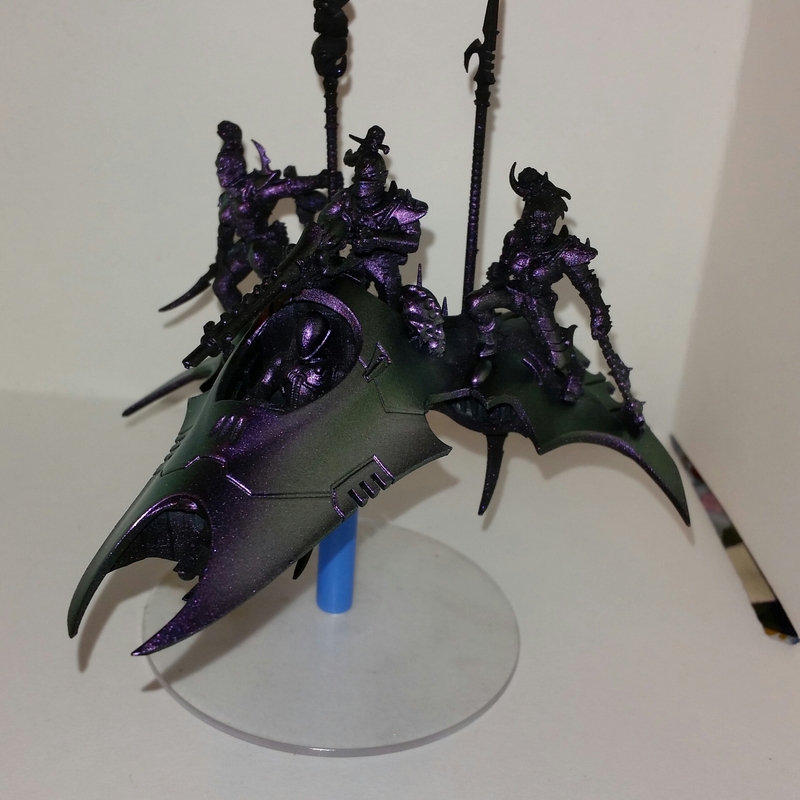 I can't wait to see what you do with the Gloomspite Battletome! Looking forward to seeing some paint on that Gobbapalooza . Yeah, sweet grot army Dread! That’s an interesting shade of plastic Skarsnik’s boyz come in too! I didn’t know they were that colour! Yup when I unboxed them, I thought they might have been molded in green but bam, their they were. 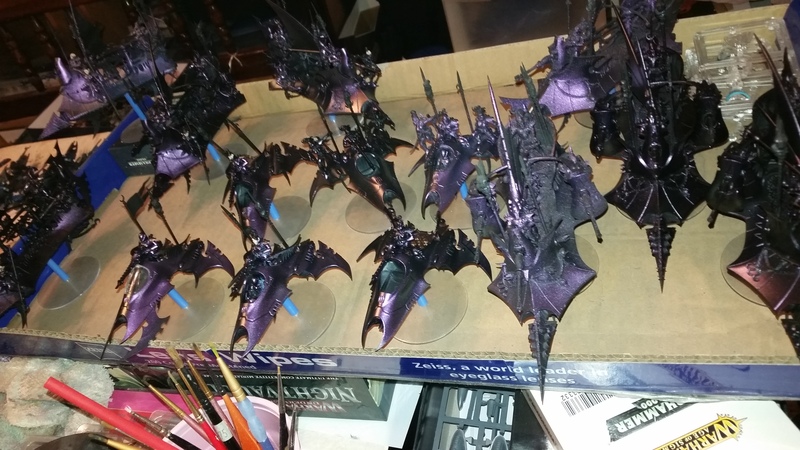 They're all primed up now, hope to start painting soon. Yall keep up they great work. I painted this for a friend for Christmas. Started painting my night goblins last night. Also f I understand out we're having a mini gaming con at our local library today and tomorrow. Back to Kill Team tomorrow afternoon, gonna be great, I need a game. Hopefully will update soon. I painted this for a friend for Christmas. Whoa Dread that is awesome stuff. Don’t know what you have done with the cloak, but I really like the way it looks. One thing though a bit of yellow from one of the 'bulbs' has got onto the tubing behind it and this could do with cleaning up. Thanks Alienscar, nice catch too. I'll have to amend that or its a glint of yellow light refraction off the tube, ya,that's it, right...we'll go with that. That is a wonderfully baroque looking paint job on that mini Dread! Fantastic work! Excellent Cawl, Dread, I really love what you've done with it! If I had one criticism that I had to nit-pick about -and this might be a product of the camera itself or maybe I'm blind- I cannot really make out the details on Cawl's face. But other than that, I think the model is gorgeous! Thanks everyone. The camera was not great but the face is done in layered greys, kinda dark. My friend bought my skitarii army from me a year ago. Kept Cawl to paint and give him for Christmas, he was so proud, he got me the kill team core book, I'm so happy to have it finally. So many things I've discovered about the game having it in hand. Anyhow, I painted him in the colors I had started doing my skitarii so he fits perfect and my buddy wants to pay me to finish the army so, I may be getting busy soon. As for the base, cork is do fun to use. You can shape it, break it and paint it to look so perfect. Dude that's awesome! Love the whole pallette of bronzes and ruddy cloth with luminous yellow highlights. The cloth is particularly nice how did you do it? Hey Ynneadwraith, thanks. I start with a black primer then coat it with doom bull brown. I use Ryza rust (dry) over all the raised detail then use Hexos Palesun around the bottom edges fading it up. The use Agrath earth shade wash in the nooks and crannies. After I finish all metals and colors I spray a matte finish over the model. So, you know the feeling when you buy that fresh shiny new army. You get all excited, go home assemble them and go through your head on what color. You do some tests buy never figure out what you want. Well I have a huge Drukhari army I got when all the new models came out years ago. I've test painted a few, even painted a few flyers but never found the right fit.....until today. Went into my local game store, the owner is one of my best friends. He says I got something new to show you. He got in a new paint line. My jaw hit the floor, COLOR CHANGING PAINT!! I FOUND IT! That perfect color, it changes from green to purple. 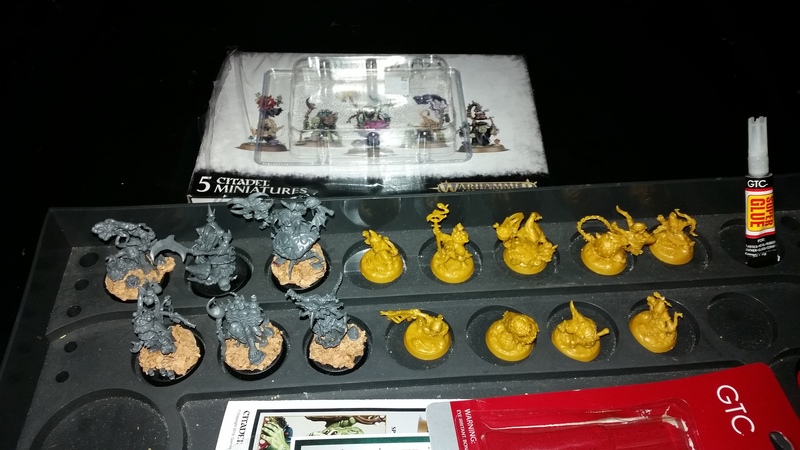 I just started priming the models and hopefully here in a bit I'm gonna thin some out and spray a base. I hope it works the way it says and if it does, ya baby! Will post pics of progress. So cross your fingers and wish me luck. The pictures don't do it justice, the color change is awesome. I got a bunch of transports based also. I haven't been this ambitious in a good while except for my Gellarpox. Here's the best pic I got. is it greenstuff's chameleon paint? It says Turbo dork on the bottle. I wish the color change would show better in the pics. Now I just have to figure out what color to use on the sails. I'm thinking red or a tan color, i am doing obsidian rose. Any suggestions? I wish I could see these colors at their most opaque, then observe the shift in the color. Looks great, Dread. Really complements the scheme too. I would like to see some of the panels and other details picked out with more colors, but the end result is great! Thanks. That's just the base coat. Lots of detail to go. Will be slow going but at least I'm finally painting them. Think I'm going to do greys for the sails, wych outfits cloth and the like. Tried silver for chains but not enough contrast so going golds copper tones. Cool, in that case, I'm officially on the edge of my seat to see one of these bad boys completed! I think these pic shows the shift in color pretty well. Bad Behavior has blocked 13601 access attempts in the last 7 days.